Today is World Water Day. At Temwa, we have been working with communities to increase access to safe drinking water and building household’s resilience to the negative impacts of climate change in Nkhata Bay North. These are achieved The Natural Way. Every human has the right to clean water and sanitation. However, this right is not the reality for a significant proportion of the 17.2 million people who live in Malawi. A staggering 12.7% of the Malawi’s population still do not have access to safe and clean water sources. Rural populations are the most affected by this calamity, where many people have limited options for water sources and many have to travel great distances for it. It is estimated that nearly half of the rural population in Malawi have to travel more than 30 minutes to access clean water. A journey which is taken by women and children. Temwa’s Catchment area; Nkhata Bay North is no different. Despite being located right next to the third largest lake in Africa, Lake Malawi, the population still faces severe challenges in accessing clean water and sanitation. The picturesque lake and the rivers that run into it are used as places to wash, go to the toilet and in some cases, drink. Limited access to clean water in Nkhata Bay North is multi-dimensional and it is caused by a variety of factors. Temwa is continuously working on addressing these challenges through its multi-programme approach. Poor sanitation practices, such as open defecation and littering inorganics in water bodies have severe consequences on water quality. Aside from contributing to the prevalence water borne diseases such as Bilharzia and Cholera, they disturb the aquatic ecosystem. In addition to poor sanitation, some agricultural practices are also contributing to the levels of water pollution in Nkhata Bay North. Most farmers in the area cultivate along the slope and some river banks. This has led to silting of water sources in the area, contributing to decreased availability of clean and safe water. Aside from cultivation, usage of inorganic agricultural methods has also contributed to water pollution. Chemicals from fertilisers and pesticides used in farms runoff into rivers and eventually pollute the water sources. Deforestation is also a major issue in Malawi. Charcoal burning, the opening of new farms and firewood collection are the main causes of deforestation, which exacerbates the rates of top soil erosion and runoff. Top soil erosion will also pollute water systems from the siltation and nutrient deposits. 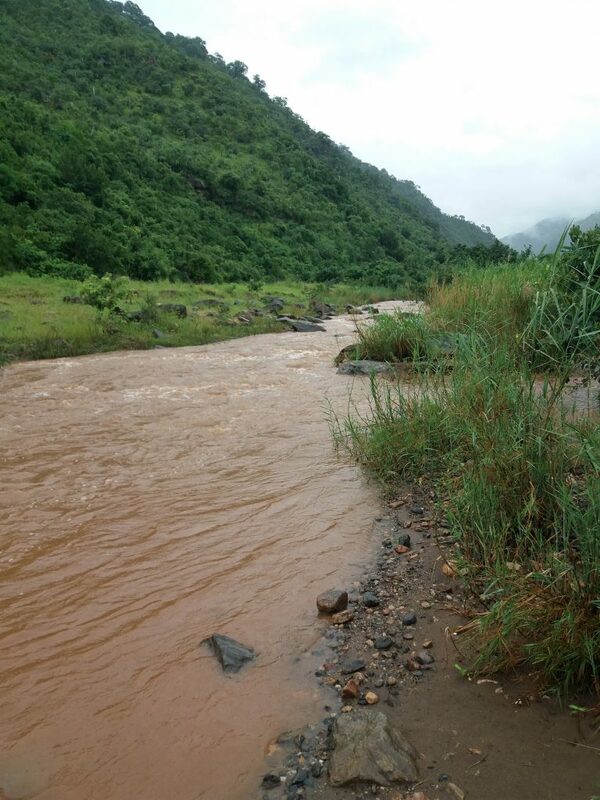 The existence of bare land, caused by deforestation, further leads to flash floods as there is just no vegetation to control the runoff of water. Climate variability is continuously impacting the communities in Nkhata Bay North. For example, unpredictable rains are causing floods (exacerbated by deforestation) and prolonged droughts. With the majority of the population relying on subsistence farming, the change in climatic conditions has severe consequences on their household food and nutrition security. Drying up of water bodies from the dry spells means that individuals will be required to walk even further to access water. What Temwa is doing to help. Temwa’s Agriculture and Forestry programme focuses on building the resilience of vulnerable households against the negative impacts of climate change for an effective livelihood. The Agriculture programme has equipped subsistence farmers with Sustainable Farming Methods (compost manure making, organic pest management, soil and water conservation amongst some). Since 2015, around 800 farmers and lead farmers have been trained in sustainable farming methods. By reducing dependence on chemical based fertilisers and pesticides and introducing them to effective soil and water management, there will be less chemical and soil runoff polluting the water bodies. Considering the interdependence in the ecosystem, the forestry programme works with local communities in facilitating community stewardship in natural resource management. The programme trains 50 village based committees in reforestation activities and provides resources for the committees to raise tree nurseries. Aside from reafforestation, the Agriculture and Forestry programmes are also focused on sustainable natural resource management through forest conservation and providing alternative sources of livelihood through forest friendly Income Generating Activities (IGAs). These IGAs removes the reliance away from the forest for income generation, by introducing and training farmers in forest friendly income generation activities, like beekeeping. These options will help to rebuild the environment, provide resilience and replenish the water system. Reflecting Temwa’s mission of creating sustainability, Temwa works with local governance structures to encourage natural resource management to be near the top of the agenda for the structures. These structures will enable long-term changes, such as formulating by-laws on natural resource management. Temwa works with 16 Village Development Committees and four Area Development Committees to assist in village level natural resource management. At the beginning of 2017, Temwa initiated their first WASH project: the Water Filter Project, to combat the high rates of water borne diseases in the area. Temwa joined forces with the SMART centre to facilitate a community led sanitation project. The project trains households in WASH practices, including the importance of building latrines (toilets), handwashing practices and clean water practices. The households then purchase a subsidised water filter through monthly instalments which uses a ceramic filter to get rid of any dirt or diseases. In Livuwu, 156 households received water filters. A community led WASH committee collect the money, which will then be reinvested back into the community through various projects. Thanks to the success of the water filter initiative in Livuwu, which reported a large decrease of diarrhoeal cases, the project has been expanded to two new villages; Mtawa and Chiwisi. Mtawa and Chiwisi are also situated along the lakeshore and have a combined population of approximately 400 households. Three hundred of which have been trained in WASH practices and filter use, and all water filters have been distributed in Mtawa and Chiwisi. These two new sites were selected by request of the communities, due to high rates of water borne diseases in these areas. The water filters that Temwa are distributing provide safe water to households. 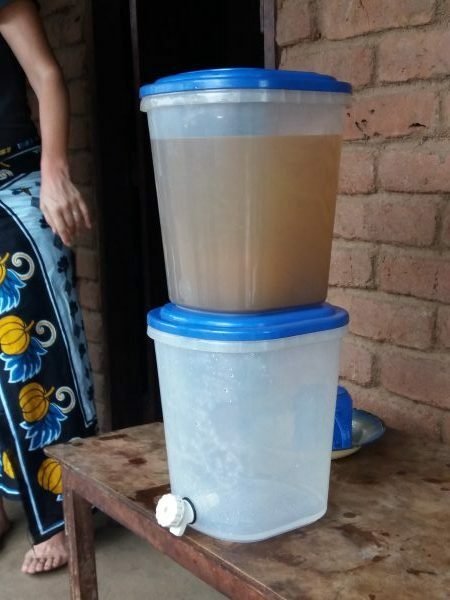 By filling the top of the filter with the dirty water, the waters passes through a ceramic filtration system which produces filtrates and clean, safe water (see the water filter in use at a household in Bweteka, below). Temwa is restoring forest eco-systems and continues to focus on natural based solutions to improve water quality. Temwa recognises that there is immediate need for improving the quality of the drinking water in our catchment areas. The natural based solutions are tackling the long term causes of poor water quality and mitigating against the effects of climate vulnerability, however there is an immediate need for WASH. The project not only distributes the water filtration systems, but also reflects on mindset change around defecation and general WASH principles. Interested in finding out how you can help provide clean water for rural communities in Malawi? Check out some of our upcoming events and challenges, and set up a monthly donation – for every £5 you give someone can access clean drinking water. Water you up to in March?